Last week the number of oil rigs operating in the US hit 566, up 15 from the prior week and an additional 29 from the week before that. 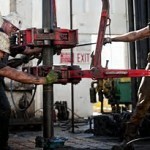 The increase of 29 rigs was the largest increase in nearly four years. The oil-rig count is now at its highest level since 11/15. At this rate, US oil production should rise by 450,000 bbl/day by year end, torpedoing OPEC’s production cuts.